Many times people require a smaller scale removal service with the same efficiency and reliability like that of a fully comprehensive removal service. Movers London Co Ltd sees and understands the need for such speedy and reliable removal solutions therefore we offer our customers access to a versatile, affordable London man and van service which provides for the required flexibility and efficiency. Our professional man and van service in London is perfect for when you need to have items shifted, delivered or sent away in the fastest, most affordable manner. Our versatile man and van service is suitable for transportation and delivery of single items, internet orders, large store purchases, bulky or awkward items which don’t fit in the boot of your car, as well as anything else you want removed quickly and affordably. 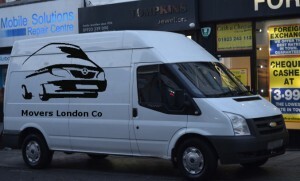 The key to our successful man and van service available in London is punctuality, versatility and affordability. When it comes to speedy, reliable deliveries and pickups we are the people you need. Our van drivers are qualified professionals who know that time is money, and that both are scarce. In order to save you a ton of additional hassles, our courteous and friendly van drivers will assist you with the removal in any way possible. If necessary they will handle the packing and labelling of items being moved, as well as loading and latching them for safe and efficient transportation from A to B. Should you require any additional assistance or advice, feel free to consult with our drivers at any stage of the removal process. Our versatile and efficient man and van service London would not be possible if we didn’t have the right transport vehicles at our disposal. The cargo vans we use are well maintained and undergo a full technical inspection in accordance to manufacturer and MOT requirements. Our vans are fitted with additional loading and latching equipment which makes the entire process much quicker and more manageable for both customers and drivers alike. The vehicles of Movers London are cleaned and checked thoroughly after every job so that your items are transported in a befitting fashion. In order to reduce overall service costs, our vans are powered by highly efficient, turbo diesel engines allowing for maximum hauling capacity and lower fuel consumption rate. The man and van service we offer our London customers can be customised to suit specific preferences and budget requirements. You can request pickup and drop-off for a specific time, you can also request pickup and delivery, or just delivery of items and purchases from a store to a specified address. We understand that timing is crucial when it comes to specialised man and van services, this is why we keep excellent short notice availability, and will not charge you a hefty sum for same day delivery requests. In the unlikely event of a delay, customers will be duly notified of the situation, and of the measures we are taking to get back on schedule in order to complete the service as soon as possible. We will be able to offer you the best possible price, no matter how basic or elaborate your service requirements. Our dedication, professionalism and punctuality will make all the difference. With us you get a complete service package which doesn’t only include timely pickup and delivery, but also attentive attitude on behalf of our van drivers, as well as friendly, accurate advice should you need it. We are at your disposal seven days a week, fifty two weeks a year. We guarantee to meet and exceed your service expectations by a mile, and do so without costing you a small fortune.